North State Telecommunications is a North Carolina telecom provider that has transformed itself from a sleepy traditional telco into a growing provider of high margin services like data centers and broadband access. Despite the company’s success, the market still values North State like the stagnant company it once was, with a double-digit free cash flow yield and an 8% dividend yield. North State Telecom’s root stretch all the way back to 1895, when it was established as a local telephone exchange serving the High Point, North Carolina area. The company grew and grew, purchasing nearby telephone systems and expanding into wireless and internet services. North State has long been run for cash, paying out most of its free flow in dividends. In recent years, this approach has tried the patience of a set of activist investors, who have attempted to compel the company to uplist to a major exchange, leverage up, or sell itself outright. Thus far, North State shareholders have voted down the efforts of the minority group to force change. Still, North State has made moves to free up capital and invest in high-growth business lines. In 2012, it agreed to sell its operated wireless operations to AT&T for $23.5 million dollars. In 2013, North State opened a data center in Raleigh and began construction on another in Charlotte. Most recently, North State announced it would provide gigabit internet to certain service areas by the end of 2014. North State’s labels its data centers, consumer broadband and business wireline business its “strategic” segments, which have superior profit margins and better growth potential than its legacy consumer wireline and wholesale businesses. For the first quarter, strategic revenues rose 4.3% year-over-year while legacy revenues declined 2.5% for net revenue growth of a positive 1.8%. Residential broadband and data center revenues were the standouts, helping to push strategic revenue to over 65% of the total for the first time. North State’s investment in data and broadband has resulted not only in top-line growth, but also in restored profit margins. North State’s margins and results had been flagging as consumers let go of their wireline service, but the new revenue streams have pushed the company’s EBITDA margin comfortably over 30% once again, and its EBIT margin back over 10%. Below are North State’s results for 2012 and 2013, and the twelve trailing months through the end of Q1 2014, in millions. Readers should note that North State earns a substantial portion of its income from ownership interests in non-consolidated affiliates. The primary asset in this category is a 5.81% stake in Alltel of North Carolina LP, a wireless company operated by Verizon. North State’s interest in the Alltel LP and a much smaller interest in a municipal telecom provider earned them $7.4 million for the twelve trailing months. While North State’s operations have gained momentum, the company has used its strong cash flow and asset divestment to reduce debt and build cash. 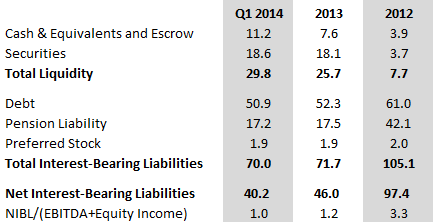 Combined with a much smaller pension liability, North State is a much less leveraged company than it was in 2012. 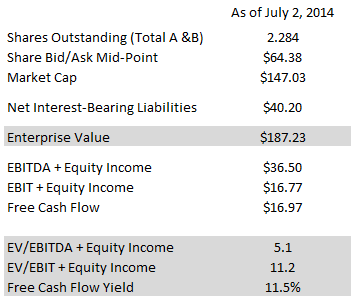 Net leverage is now a very comfortable 1.0x EBITDA + equity income. North State’s pension liability has been cut dramatically via strong stock markets gains, and also by closing the pension to new participants and making other benefit reductions. The pension is invested approximately 50/50 between equities and fixed income, and carried an 8.0% return expectation as of 2012. Should equity market turn south, the pension deficit will widen, but it’s not likely to be at an issue with cash and securities holding so much higher and debt lower than in 2008. North State has two share classes: A and B. Both are very illiquid, but the A shares are much, much more so. B shares are fewew in number and non-voting, and currently trade at a bid/ask spread of $63.75/$65.00 while the A shares trade at $68.75/$80.00. In looking at North State’s valuation, I’ll use B shares figures, since they’re much cheaper. At these prices it’s rather pointless to purchase the A shares, unless one wants to mount an activist campaign. North State’s valuation points to market expectations of flat revenues, earnings and cash flows, but I suspect the market is wrong. 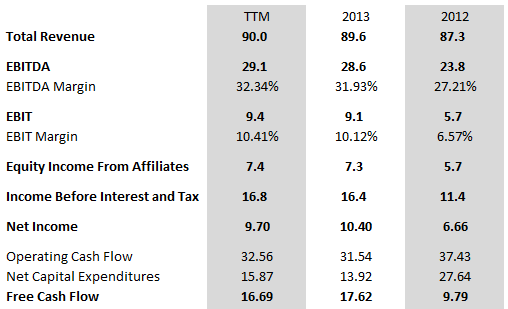 After all, EBITDA + Equity Income rose a very healthy 6.5% in Q1 2014 versus Q1 2013, better by leaps and bounds that what a typical traditional telco could produce in the current technological and economic environment. If Q1 figures are a good indication of what North State can do for the entire year, EBITDA + Equity Income will rise 7.4% over 2013’s figures. This figure does not include the additional revenues that North State will earn from its Charlotte data center once that is opened, or from its gigabit internet initiative if that proves popular. If North State truly is the internet and data company it says it is, it’s worth much more than the modest ratios its stock now commands. Alluvial Capital Management, LLC does not hold shares of North State Telecommunications Corporation for client accounts. Nice find! Curious, who are the activists? Not sure, but the lead guy is apparently from California. An 8.0% return expectation for the pension seems aggressive. I wonder what the industry standard is, and what their equity/bond mix is. If I were really interested in this, I’d consider trying to estimate how much larger the pension obligations would become with, say, a 6.5% (or lower) return expectation, and what that would do to EV-based calculations. Also, given the high portion of pre-tax profits from the equity income from affiliates, those would likely call for a bit of investigation – what’s the prognosis for those investments and the income streams from them? I agree that 8.0% is a little aggressive for a 50/50 equity/fixed income blend, but sadly it’s not nearly the lowest expectation I have seen. I would be more concerned about the pension deficit if the plan hadn’t been closed to new employees, and reduced for existing employees over the last few years. The affiliate income is actually pretty common for these smaller telcos, and these sort of wireless partnerships operated by a major (Verizon in this case) tend to be good investments. They throw off a lot of cash and grow over time at about the same rate as wireless usage in their area. CIBL, for instance, had a few of these which it sold to Verizon. The wireless market is a lot more mature than it was a few years back, but North State’s ownership in the Alltel LP is one of its most valuable assets. NORSB seems like a better find than APTL, but even worse liquidity (didn’t think that was possible). I’m thinking this way because of the substantial dividend and activists in the mix could push changes while having similar valuations. I’ve watched this company for years, and I am finally convinced that its transition away from the traditional telecom model has been a success. Very tough to pick up shares, but also very undervalued. The nice thing is you get paid to wait for the market to catch up, because the company pays out most of its free cash flow in dividends. Kindly contact me at sarit@seekingalpha.com. These guys don’ report to the sec and I cannot find any news on them. We’re do you get the numbers on the company? Anybody have any thoughts on the latest quarterly earnings report? I’ve glanced at it but haven’t really had time to fully digest it. 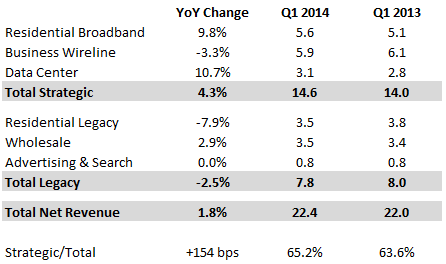 Sales are up…but earnings & cash flow are down. Looks like they bought a consulting firm…might be a good move. They’ve got a lot of capital expenditures though. The dividend is being paid. The stock has been volatile lately. If you were quick, you could have got it under $60/share. Dividend yield is now over 10%. Seems like everyday somebody is trying to sell shares and the bid just keeps going down. There seems to not be very many buyers. They need to cut back on this data center stuff. Clearly they have not getting a good value on it. Why buy something for 5.5X revenue? Why not just build out your own and start competing? Management needs to focus on basic blocking & tackling. Earn money, pay down debt, pay dividends, slowly & prudently grow the company! SURELY management must know that if the dividend is cut, they will lose their jobs. What’s going on with the large B/A numbers on this stock?